Online learning provokes questions about the nature of place and institution for distance learners: what does it mean to be a student at Edinburgh who is not in Edinburgh, and what insight does this give us into learning design for high quality distance programmes? This project explored notions of place and institution for the MSc in E-Learning (since renamed the MSc in Digital Education) in the School of Education at the University of Edinburgh. Over one year from September 2011, we conducted a piece of research in which narrative and visual data was generated by students within the themes of place, home, and institution. The question of students' identification with their institution is a key strategic issue for recruitment and retention, and also for the quality of the student experience once studies are underway. 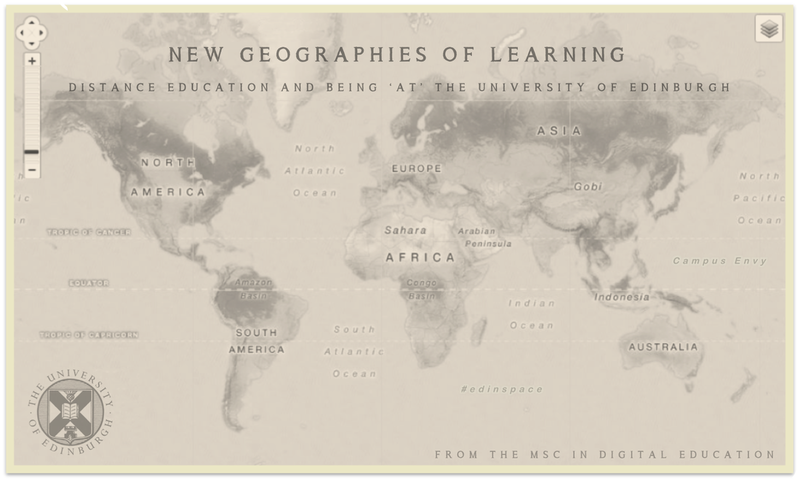 Our aim was to use the thinking generated by the project to develop new teaching approaches for the MSc in E-Learning and other distance learning programmes, taking into account how to be a distance student is to be immersed in a new geography of learning. We set out to undertake two phases of data collection, beginning with narrative interviews based around the theme of arrival stories, followed by the collection of visual data or images that somehow represented what it means to be a distance education student. From this emerged a third and final phase of data collection where we invited participants to submit digital, multimodal postcards that depicted their study spaces. Since May 2012 we have been disseminating the findings of our work, including presenting our work at conferences, followed by the recent publication of two papers, during September 2013. This project has been funded by the Principal's Teaching Award Scheme at The University of Edinburgh.